What kind of project takes you to 23 states and 9 countries without leaving home? 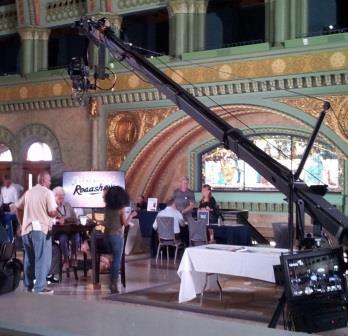 Genealogy Roadshow tapes at Union Station in St. Louis. I had the good fortune to be part of the incredibly talented research team working on the second season of Genealogy Roadshow. Don’t look for me onscreen, though, the hot seats are filled by the lead genealogists: Joshua Taylor, Kenyatta Berry and Mary Tedesco. I was able to attend tapings in St. Louis and Philadelphia, and look forward to seeing the final versions from those cities plus New Orleans when the season debuts on 13 January 2015. Check your local PBS station for times (8pm ET in most locations), and while you wait for the premiere, check out the trailer!